THQ Chief Executive Brian Farrell says UFC Undisputed 2010 has "confirmed our suspicions" that an awful lot of people are buying pre-owned games. 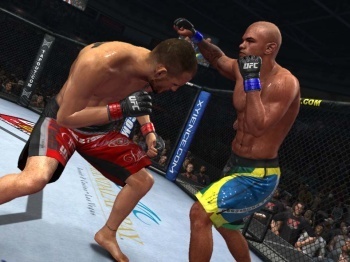 THQ announced in May that UFC Undisputed 2010 would emulate EA Sports' "Online Pass" by including a single-use code to enable online gameplay, forcing those who buy used copies of the game to fork over $5 if they want to take part in multiplayer action. Some gamers were predictably unhappy with the move but Farrell said the strategy is paying off with a "pretty good attach rate" and by giving the publisher an idea of just how many used games are actually being sold. "What we saw when we did the online charge for the second purchaser of UFC was we found a pretty good attach rate - it confirmed our suspicion that there are a lot of people participating in used games," Farrell told MCV magazine. "It is one of those things of how much money could you have made if it wasn't for piracy or used games? It's a tough question because you don't know." He said that THQ understands the business models of specialty game retailers, which rely heavily on pre-owned sales in order to maintain decent profit margins, and that both retailers and publishers are working on new strategies that will hopefully keep everyone happy. "Retail is now thinking about how they can participate in DLC and some of these second user charges that we're doing. We are not trying to push retail aside. We just need to monetize because it is our investment," he said. "We will work with retail but it needs to be more give and take."